Today’s the day! The Boba X is officially shipping and ready for purchase. If you missed my first glimpse, go check it out here. Here’s what it looks like fresh from the box. I had the opportunity this week (and this past weekend) to try out the Boba X myself, and help some mothers fit the new Boba X. First of all, the fit! It’s comfortable. It fits me well. It also fits my 4 year old well and keeps her in a spread squat position. This position isn’t as important for her at this stage but if she had special circumstances — especially low muscle tone — I feel this carrier would support her well. The height hits her just below the base of her arms, which is the perfect support for her back (plus it keeps her safe, so she can’t do a back bend right off of me). No stirrups: My kids had a love/hate relationship with the stirrups. I did as well. Let’s just say there often was one missing even though I always put them back in the same place. One would get knocked off the shelf or something would happen to them (I’m looking at you silly kiddos who like to hide things and make mom feel like she’s going crazy!). This carrier has zip in panels that are “toddler extensions.” They’re a little bigger than the stirrups so hopefully would be a little easier to keep in one place, or at least easier to find if they get temporarily lost. Adjustable height and body width: There aren’t specific settings either-it’s super flexible how you can adjust this carrier to fit different kids. Lots of flexibility of adjustment for fit: As with other Boba carriers, there are lots of possible adjustments including two ways to tighten the arm straps. This carrier also features two adjustments to bring in the front part of the strap (I think this adjustment will be wonderful for petite parents who find that other carriers gap away from their body) and to shorten the body of the carrier. A new feature is that you can criss-cross the straps while baby is in a front carry. This is a comfortable way to wear a little bit heavier baby longer term. The waist band is long enough that most parents will be able to wear it and easily switch between wearers. Great pocket for your phone: Just like on the Boba 4G, there’s a great pocket on the waist for your phone, some cash or a card, and or a lip balm (or other small non-poky object). I compared the pockets on the Boba 4G and Boba X, this one is a bit larger. There’s still a little flap that snaps down the strap of your purse, diaper bag, or backpack (there’s one on each strap). Right now the carrier is only available in grey but new prints will be released soon. This grey is a really beautiful color though and very neutral. I believe a mother and father (as well as the rest of baby’s family and caregivers) would be happy to wear this without complaint. A lot of thought went into the design: The zippers that you use to zip on the extra width panels are hidden (they won’t bug little legs). There’s a safety elastic strap that will hold the buckle on the strap if it somehow comes undone by accident. This is an extra measure to help keep baby safe that was integrated in the carrier. The instruction manual is very thorough. This is important if you’re a new wearer or don’t have experience with a Boba carrier. I always recommend looking over the manual before starting to play. This is how I learned this carrier offers an option of criss-cross straps for front carries! I still am a bit worried that the toddler extensions that zip on to make this a toddler carrier will get lost. Since my youngest is an older toddler, I plan to keep them on the carrier except when I’m helping families try out the carrier. The zippers were SUPER stiff on the panels. It took a few times of zipping on and off and they’re still a bit stiff but I’m able to zip them on a quite a bit easier now. The webbing was much stiffer than I remember being on previous new Bobas that I’ve tried. This could be easily remedied by washing and laying flat to dry before playing or by loosening and tightening the carrier a few times before using. The “tabs” on the bottom of the adjusters (see picture below) were kind of short (especially the one that has the buckle). I like a little bit longer of a tab so that I can pull it up to release the strap to loosen it. It took a little hunting around while adjusting a doll in a front carry to find the tab to lift up to loosen. As I’ve played around with the carrier more, it’s gotten easier to hunt for these tabs and I can feel a little bit of a difference between them. Arrows are pointing to the “tabs” that you can use to help loosen straps. This picture shows one strap and the two different places you can adjust the tightness of the strap. Elly’s son typically prefers ring slings. He hasn’t been much of a fan of soft structure carriers. The width of the carrier with the toddler extensions was a little too wide. As pictured, we tried to insert the hook portion of the Velcro in the loop Velcro portion with the body because the body without them was a bit too narrow in my opinion. They were designed to go in a separate portion. After this mother left, I figured out another trick that I think would have fit a little better. I will share this trick with you next week! Elly’s main concerns were that usually an adjustable carrier is like a car seat, not easy to switch between two children. You have to keep getting them in and out of the seat to make sure it fits properly before getting baby fully buckled in. This could be a concern with this carrier, however, typically, the webbing will get a little indention so if you’re switching between wearing a toddler and an infant, you likely will be able to set the carrier pretty quickly based on the webbing “memory.” She also thought that it would be a great idea to have a different texture (somewhat like braille) on the different tabs so you know which one you’re adjusting when reaching behind you. The carrier was really comfortable. Her baby prefers front carries so she didn’t try a back carry. He settled in well to the carrier and enjoyed snuggling with his mama. Elly did notice that she had a little bit of a pressure point under her arms, especially when her arms were tight to her body. This is one common complaint that some parents have when using a soft structure carrier. Erynne M. and her 7-week-old daughter. Erynne enjoyed putting her little squishy baby into the Boba X. She said, “It feels like I’m wearing nothing.” She had previously mentioned that she had tried an Ergo with one of her other kids. The Ergo had burned her out on using a soft structure carrier. She was optimistic trying the Boba. Erynne has shorter arms and with the webbing being stiff, she had some difficulty adjusting the carrier. Once we got it adjusted on her, though, it was really comfortable. She mentioned the only pressure point she felt was her baby’s head against her body. As a Certified Babywearing Educator, my main comment was that her baby fit very well into the carrier. We didn’t have to tighten the straps all the way down to make the panel as small as it could go. The placement of the hood in the pocket helps add some extra support to her baby’s neck. We adjusted the width down as far as it could go and it fit this baby really well. This carrier certainly has some sleepy dust. Baby settled right in for a nap in the carrier. Emily H. and almost 3-week-old son. Emily is a busy mom with 4 children, including newborn twins. Her newborn daughter was sleeping while we played. Her adorable baby boy was happy to help us try out the Boba X. While the carrier felt comfortable and fit her body well, she commented that her son seemed a little too low in it. I agree. She likes the ease of a soft structure carrier. “Wovens and ring slings have scared me a little with the learning curve.” She didn’t feel any pressure points while wearing this carrier. As a Certified Babywearing Educator, I believe that even adjusted all the way down, the panel was a little too wide for her infant. I believe when he’s just a couple more pounds and a couple inches taller, he will fit in this carrier great. Bottom line on fit: As tiny as newborns are, it’s hard to fit a carrier to every tiny newborn through long-legged toddler. As for my asterisk earlier, I believe this carrier would fit a 9-10 lb newborn quite possibly. I would suggest checking for knee to knee support. Every baby is built a little bit differently. If this baby’s legs were just a little longer, he would have had wonderful knee to knee support. If you want to use this carrier birth to 45 lbs, I would suggest keeping an eye on the fit for both the height of the body of the carrier and the panel width. If it doesn’t fit well when baby’s BRAND NEW, give it another week or two. I may not call this a full birth through toddler carrier but it’s much closer than any other soft structure carrier that I’ve worked with putting a newborn in. The carrier didn’t gap from baby’s neck and gave great support. The Boba 4G seemed to fit and support baby’s neck better from about 2-3 months on. I believe this carrier will fit many babies from about 2-3 weeks on but I encourage you to try it with your newborn! I’d love to hear your experience with this carrier! Boba sent me a brand new Boba X to review. I can’t wait to share more with you this upcoming week. I want to give you a first look at it though! Fluffy mail! As soon as my doorbell rang, I dropped everything and ran. I couldn’t wait to unbox and check it out. Apparently the front of the box wasn’t going to give me any hints! But look at the back-still no pictures of what’s inside but I love this quote. Are you ready for it?! Well, here it is! Boba’s new carrier is rated to be worn from 7-45 lbs. It has features to narrow the body to fit a newborn and stretch to support a toddler. I’ll be reviewing this carrier and have asked for the assistance of some local families to help me review this carrier with babies of different ages and stages. Check out my post next Thursday for more information. Boba X will be available for shipping May 10th but you can go to their website to preorder now. New prints will be released over the coming weeks and months but for now it’s available in this gorgeous grey. Boba also has a great video teaser on YouTube if you can’t get enough of this awesome new carrier. This post continues the ages and stages babywearing series. If you would like to learn more about newborn babywearing, wearing an infant until they’re able to sit up on their own, or wearing an older infant in to toddlerhood check out my earlier posts. Babywearing in to toddlerhood and beyond is a great way to bond with your child. It’s also a good way to build your core muscles. Newly walking legs get tired easily. When you can grab a carrier and put your child up on your back it can save everyone’s sanity when you are on vacation, visiting a theme park, hiking, at a festival, and more. Babywearing also allows you to be able to go to places that strollers aren’t permitted and allows your child to interact more closely with you and the world on your eye level. Babywearing while hiking on the Oregon coast. Woven wraps are warmer for hikes than a soft structure carrier but can be more supportive as well. I have children who have had sensory defensive issues (the part of sensory processing disorder that makes them really want to push away/not participate in highly sensory situations). We really enjoy going to festivals. My middle son (pictured above) enjoyed the people but didn’t enjoy the noises. Wearing him helped him be able to interact on a level he was comfortable as well as receive the calming sensation of being wrapped snuggly (like a big hug as my children have described babywearing when they’ve had more words). My oldest son was extremely shy. Babywearing allowed him to turn his head in to me when he didn’t want to interact and people were more respective of his space when I was wearing him (though not always but it was easier for me to tell he needed a break). Babywearing children with special circumstances and needs can be extremely helpful for their mental and emotional well-being as well as yours (being able to provide the extra snuggles which also helps release oxytocin which soothes and promotes bonding). Toddler wearing is also very helpful to soothe bumps and bruises and fits by offering additional comfort (while being a little easier on your body and arms than holding in arms when baby begins growing larger and heavier). Toddlers are also notorious for falling asleep in the car RIGHT before you reach your destination. Babywearing can be a great way to help meet your child’s needs (and allow them to continue sleeping) and your needs to make it on time to your appointments! Toddlers are notorious for falling asleep right before you reach your destination! Babywearing can also be a great way to keep little curious hands out of danger but caution should always be taken to watch what those hands are grabbing while you are wearing baby on your back. This little gal (below) had recently split her head open. She goes to a lot of conferences and events with me. Babywearing has helped me to keep her calm while I’m working and also keep her safe too. So what carriers are good for toddlers and preschoolers? It’s important to keep YOUR child’s needs in mind. After baby is 2+ the spread squat positioning isn’t quite as important but it’s the normal position for the hips so best practices are that you continue to support that position. If baby has hip dysplasia or is at higher risk that position is very important to support. It’s important to counsel with your doctor and physical therapist if your child has special circumstances or needs so that you may be able to meet those as well as caring for their medical situations. Woven wraps can always support that position through spreading the wrap to hit knee to knee. Try different lengths-shorter wraps won’t be quite as supportive (using fewer passes over baby) but may be quicker to wrap if your child likes to get up and down a lot. Shorter wraps are also easier to tuck in a diaper bag or even in your stroller if you go back and forth between wearing and baby strolling. Soft structure carriers and more structured carriers (like mei tais) may not support this position anymore because likely the panel isn’t wide enough any longer unless you purchase a toddler or preschooler specific carrier or one with stirrups (such as the Boba carrier). Also, it’s likely at this stage that your child has outgrown the height of the panel as well. If it doesn’t reach the base of their arms (where their arm meets their body) or higher up on their back the carrier is not considered tall enough any longer. There is a fall and lean back risk even if your child usually does not lean backwards. This is the first time that my oldest “made cookies” with me. Babywearing allowed me to mix cookies while keeping him secure in a new environment he hadn’t been in before. Ring slings may be ok for a few minutes here and there but many parents find that their back will get really tired using one for more than a few minutes. I teach best practices for positioning for all babies because suboptimal positioning puts baby at risk for possible hip/spine issues down the road. Like how drinking alcohol doesn’t ALWAYS cause liver disease or smoking doesn’t ALWAYS cause lung cancer the benefits and risks should be weighed when making decisions. The risk is there and I recommend minimizing that risk. I am a Boba Ambassador. I do not receive payment from Boba but will occasionally receive new products and updates from time to time. I am a Boba Ambassador because I believe in their products. For more information about this as well my other disclosures please visit this page. If you’re in the Oklahoma City area and would like some hands on babywearing help please contact me or visit my website. What is your favorite carrier for a toddler or preschooler? Don’t Put the Car Seat on the Cart! It’s been publicized that the practice of attaching a car seat to a cart is not considered safe but when I go to a grocery store in Oklahoma City I usually find at least one baby in their car seat “snapped” in to the cart. I would like to remind any parent reading this that if they are doing this currently to stop right away but don’t feel bad or guilty for doing this. Many parents have “snapped” their car seat to their cart (myself included!) before knowing the dangers. When we know better we do better! So why is it dangerous? Car seats were not designed to sit on carts. All carts are differently shaped. Even if the seat will “snap” on to the cart this practice is dangerous because it may break the part that clicks in to the base in your car which will render the seat ineffective in an accident. Putting a car seat on a cart in this manner also makes the cart top heavy. A small shift of weight by baby or even a shift of the cart can make the whole cart tip or the baby and seat to tip off of the cart which can seriously injure baby. Another cart flaw can cause baby to fall through a cart and become severely injured as shown in this video. Injuries associated with shopping carts are an important cause of pediatric morbidity, especially among children younger than 5 years. An estimated 24200 children younger than 15 years, 20700 (85%) of whom were younger than 5 years, were treated in US hospital emergency departments in 2005 for shopping cart–related injuries. Providing adult caregivers with alternatives to placing a child in a cart while they shop can effectively prevent shopping cart–related injuries. Some stores provide supervised play areas for children. Parents may be able to arrange for another adult to accompany them and watch the child during a shopping trip. Other parents may be able to transport a young child in a stroller, wagon, frontpack, or backpack. An older child can be asked to walk. Some parents may be able to leave their child at home with an adult while they shop, but this is not an option for many others. Some stores offer shopping via the Internet with or without home delivery. Many carts now also include warnings to not put an infant in an infant seat on the cart. Even if the cart includes a rest for a car seat it still isn’t recommended to do this because it can cause the cart to be too top heavy and tip or the seat to tip out, especially if a parent forgets to buckle the seat in to the cradle. Car seat manufacturers also caution against this use of car seats. It’s in your manual. If you don’t read other instruction manuals do read your car seat manual! Your baby’s life could depend on it since a car seat is a potential life saving device in a car accident. Read the manual! I suggest that parents have a soft baby carrier that they can put baby in while grocery shopping if there isn’t a built in infant seat in the car seat (but again, these can cause the cart to become top heavy so use with extreme caution and always buckle baby in!). For more information on types of carriers and carriers that are good for different stages please check back to earlier blog posts. When baby is old enough to sit alone it’s safe to put baby in the toddler portion of the cart (about 6-8 months). Until then, consider wearing your baby at the store. If you need help choosing and using a baby carrier in Oklahoma City, Mustang, or Yukon please visit my website or contact me. What is your favorite carrier to use while at the store? This post continues the ages and stages babywearing series. If you would like to learn more about newborn babywearing or wearing an infant until they’re able to sit up on their own check out my earlier posts. The spread squat position is still very important at this stage. Be sure to read more about this in my newborn babywearing post. When baby is in the carrier you are looking for this position (notice the curved spine and the knees higher than the bum (capital M position). A ring sling for shorter periods of time. You may begin considering a wrap convert ring sling if this is your favorite carrier and you want to wear for longer spurts because the heavier weave helps distribute weight better. Gauze or Hybrid wraps may become a little less comfortable as your child grows. No stretchy wraps-they will not support the spread squat positioning at this point. Mei tais start becoming a great option at this stage! Soft Structure Carriers are also a great option for quick up and downs. As babies grow and become older they will begin to like quicker up and downs (especially as they begin to walk). Babies will also grow heavier but if you’re used to wearing your muscles will grow along with baby. There’s no need to restrict wearing based on your child’s size/weight unless you have a medical condition to consider. You may also begin to be interested in back wearing. Back carries can help you wear for a longer period of time more comfortably as your child grows but remember that babies like to snuggle too and knowing how to nurse in a carrier is a good skill (not every mom is able to nurse in a carrier but if you can practice in several different carriers most mothers can find a way to comfortably nurse while wearing). You may spend more time out of the house and at this point you may almost mourn if you have forgotten your carrier at home. It’s a good idea to have an inexpensive back up carrier in your car or diaper bag or keep a carrier in your car all the time so your arms and back don’t ache when you’re out and forgot the carrier. Boba Selfie! Back carries help baby interact with the world (including staying safe while watching older brothers ride bikes). Back carries can also help baby interact a little more with their world. When baby can see over your shoulder they can see and experience what you see but also be able to snuggle in when they become overwhelmed or shy. At this stage you may experience a baby that wants to nurse and then doesn’t fall alseep nursing any longer. Wearing your baby down may be a very lovely skill to have in your toolbox of parenting tricks. With practice you can wear your baby and take a walk around your house or neighborhood (make sure to have a flashlight and stay safe at night!) or just snuggle and rock. The tightness of the carrier often works better for this then just sitting in a rocking chair. Make sure when you put baby down to remove the carrier so there are no suffocation hazards. When you’re beginning back wraps practice while kneeling on your bed or a soft surface and/or start low. Practice getting a good seat in a front wrap cross carry before attempting back wrapping. Use a mirror or your computer camera to help you see what’s going on on your back. Get hands on help! It makes a huge difference. I recommend doing the “superman” method for getting baby on your back because you stay in full control and contact of baby while putting baby up. Here’s a video that shows this technique. What is your favorite carrier for an infant that can sit on their own? We’re going to talk about babywearing support. There are two types of babywearing support-volunteer support from a babywearing group leader, and paid support from a babywearing educator. I have broken down the differences in this post and I highly encourage everyone to read it to understand why there’s a difference. I started a babywearing group in Ogden, Utah when my son was about a year old mostly to find like minded moms to bond with. It didn’t really get off the ground until another awesome like minded mom came in and started really organizing things (she knew other babywearing parents at that time, I didn’t). I really enjoyed the group for a few months before we moved to Oregon for my husband to attend graduate school. Less than a year after we moved I knew I really needed to create a support group in my new community and I better knew how to get it off the ground. 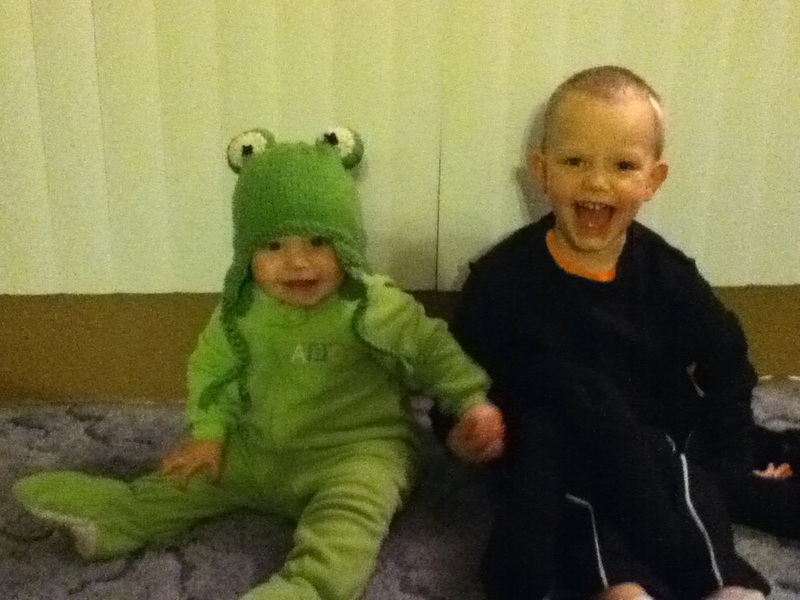 I started Corvallis Babywearers in May 2012. I had seen some dangerous babywearing practices and heard from a lot of families that they had wished they’d been able to babywear but the two options that they could purchase locally didn’t work well for them and they didn’t know there were other options available. I was able to work in my community until we moved after my husband graduated last August. There are still some wonderful women that are keeping the group going which I’m so happy about because it was a great passion of mine and I put a lot of work in to it. While we lived in Oregon I had the opportunity (in March 2014) to attend the Babywearing Institute on one of our trips back to visit family in Utah. I was taught by Beate, the founder of the Babywearing Institute, who has been babywearing since she lived in Germany and wrapped her siblings. She and her husband own Storchenwiege which makes beautiful German-style woven wraps. They also own the online shop, Children’s Needs. I was surprised how much I learned and different wrapping techniques. I also learned better practices for how to teach babywearing. I used the skills in my babywearing group but also started offering babywearing consultations until we moved. I took a short break while we got settled and I again offer babywearing consultations. I love both types of support and both types will help you wear your baby. There are advantages to having a paid consultation and there are advantages to a support group. I would like to share some tools to help you find local support. Babywearing International (not all babywearing groups are affiliated with BWI and are still awesome groups so be sure to check out several tools to see all the groups available in your area). A special note on YouTube. You can learn to do a lot of things on YouTube. Some can be dangerous and some can show not-as-optimal positioning. It’s important to learn what is optimal positioning before scouring YouTube for videos. I have compiled many babywearing videos on my YouTube channel. You can check out my babywearing playlists here. Where is your favorite place to go for online babywearing support? I am a Certified Babywearing Educator and a Lactation Educator. I offer babywearing and breastfeeding classes and consultations in the Oklahoma City, Mustang, and Yukon areas in Oklahoma. If you are interested in learning more you can contact me or visit my website. This is a question that comes up a lot from my readers and people who visit my website. Where can I purchase a baby carrier? I am here today to share some local resources for purchasing a carrier in Oklahoma City and some sources on the web. I’m also sharing some places that you can purchase a used carrier as well. I will mention that it’s a good idea to protect yourself when purchasing used. I will share some tips later on in this post. I would love to keep this updated so please let me know if you find a broken link or want me to add another shop on here! The Worn Baby: (Piper of Babywearing Support of OKC on Facebook and local meetings) Offers local pick up, payment plans, and a trade in program. I just want to mention to ask your local babywearing group if they have an affiliate account with an retailers because often groups will have a special discount or receive a portion of sales. Be sure to use Paypal and pay through “goods” so that you’re protected. Be sure that you get lots of pictures in good light. If the seller isn’t providing enough pictures (especially of any flaws they mention) ask for more. If they won’t provide them it may not be worth the risk purchasing the carrier. Speaking of flaws-if the seller doesn’t mention any or doesn’t have a good description of the carrier, how it was used, if it was used in a smoking/non-smoking home, if it comes from a home with animals (or was ever used to hold an animal), etc ask them. Don’t ever assume because something is left off or is vague. Asking lots of questions is super important even if a carrier is your “unicorn” (something you’ve really wanted for a very long time or even a short time). Get insurance. If you can afford to be out the package don’t worry about this one but most of us really can’t be out the carrier and what we paid for it. Paypal does protect you but making sure to pay extra for insurance is a really good idea because the post office does lose packages. Watch tracking. Make sure the seller is willing to get tracking on the package and watch it. USPS doesn’t always update so don’t panic if it hasn’t moved in a few days. Sometimes packages run late as well but it’s a good idea to get tracking and to check it every couple of days. If you need help finding a carrier I offer sessions that I can sit down with you and help you shop for a carrier that you will love. Feel free to contact me on via email with any questions or book a time with me. You can also find out more about my breastfeeding and babywearing classes on my website. Where have you purchased a carrier online? This is a picture that I took before going on Periscope before my Breastfeeding Basics class on Saturday. Did you know that I am on Periscope? I love to answer your questions live and demonstrate breastfeeding equipment and babywearing techniques. Do you have any questions you would like answered live? Please feel free to drop me a line with the subject “Periscope” so I can be sure to answer them the next time I go live. You can find me @nurturingbonds on Periscope. You can also check out my Katch.me if you miss the replays on Periscope. Remember on replay on Periscope you can still tap to give hearts! Check me out on Twitter, Instagram, and Facebook too! I’d love to follow you too! Leave your Periscope, Twitter, Instagram, and Facebook usernames in the comments and I’ll follow you! Thank you all for sharing your pictures with me! Here are some of my favorites. Hopefully they spark some ideas for you for next year. Be sure to subscribe to my newsletter and subscribe to my blog (see the right side panel to enter your email to subscribe). As a bonus for subscribing to my newsletter you will receive not-yet-published Winter Babywearing Tips just in time for winter! I’ll also be sure to remind you of this post before Halloween next year. 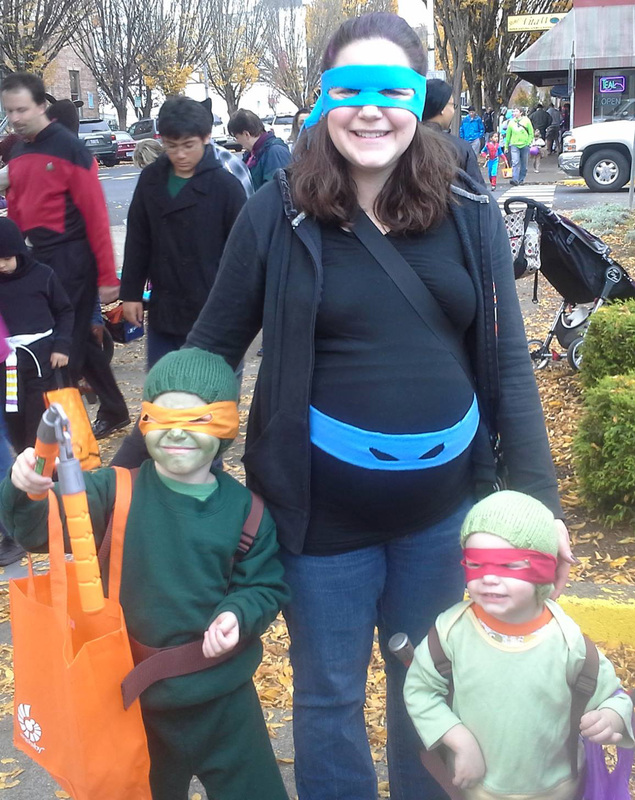 Babywearing Halloween costumes can be simple or complex, expensive or cheap. 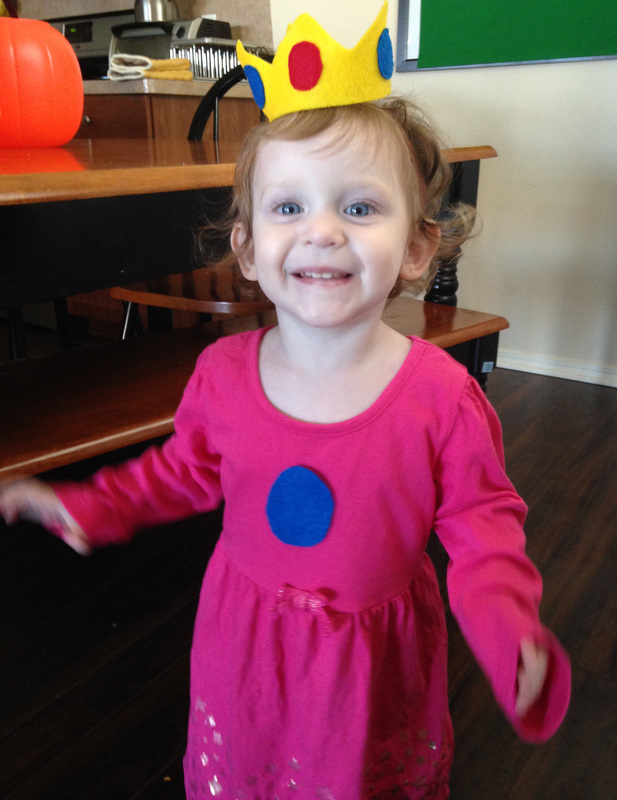 Hopefully this post will inspire you for your Halloween costumes! 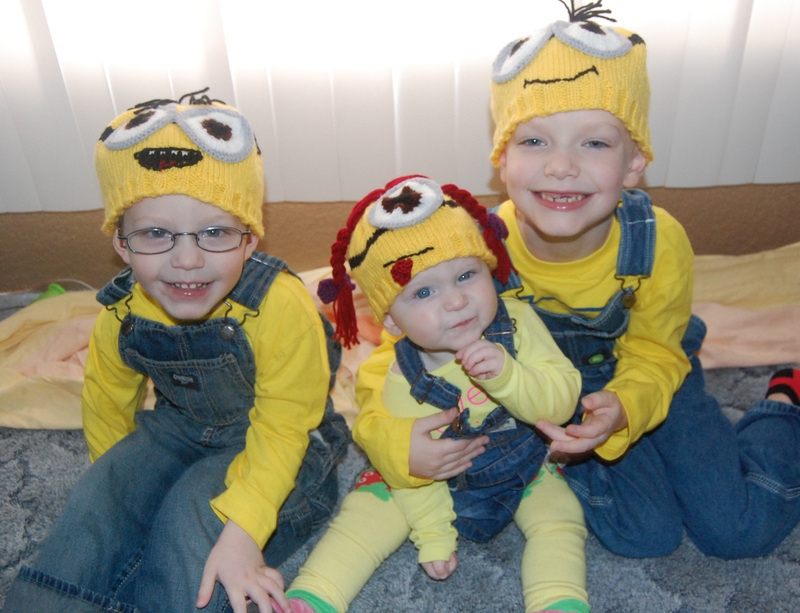 Here’s another picture of us from this year from Halloween right before going out to trick-or-treat (check out our ideas that we have done in past years in this post). Peach didn’t last on my back long, she decided to walk most of the time and I ended up leaving my wrap at home and using my Kinderpack to get her on and off quickly. 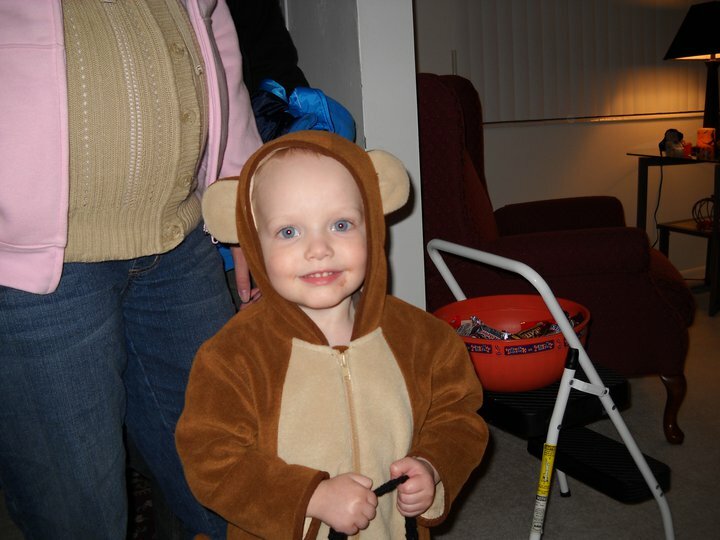 She loves being wrapped but enjoyed asking for candy and walking with brothers more this Halloween. 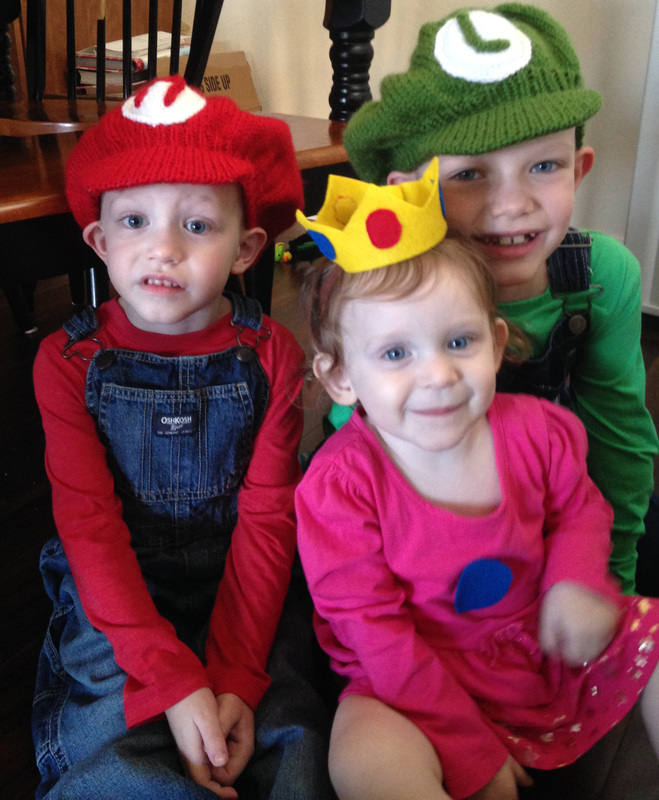 Mario, Luigi, Yoshi (hat found on Etsy), and Princess Peach is wearing a pink dress and a hand made felt crown with an elastic running across inside and clipped to her hair. I’m wearing a 4.6 Natibaby Amazonia wrap. Family Superhero theme by Elise H.
Spider on a mama spiderweb by Niki R.
Bank robber and her money bag by Jessica C.
Robber family with their money bag by Samantha O.
Grandma, Little Red Riding Hood, and the Big Bad Wolf by Stephanie H.
Two fun and groovy family costumes from the Zurovetz family from 2014 and 2015. Which one is your favorite? Please feel free to comment below! We have had a few costumes that we have incorporated babywearing in to in the past. I will share those with you first in order of most recent (taken yesterday at a Trunk-or-Treat party) to oldest. 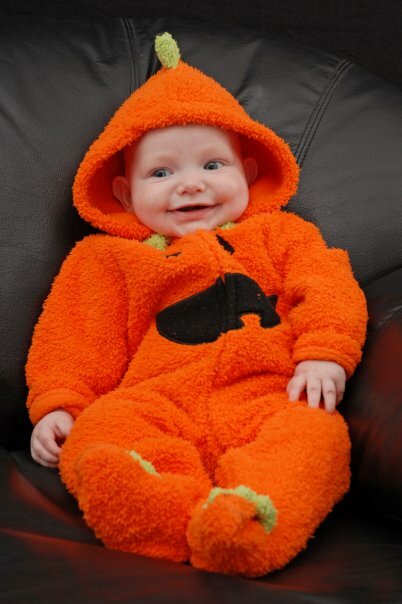 I also will share some cute Halloween pictures from before we did babywearing costumes special because who doesn’t love seeing cute kids in Halloween costumes?! I would love to do a Halloween costumes idea post so if you’re interested please email me at monkeybunns@gmail.com with your pictures and let me know that you’re ok with me sharing them in a post on my blog (please state that or I won’t be able to share them!). Please send me your pictures by November 2nd! (Must be YOUR picture and you must have the rights to it). I don’t have a picture of my little gal on my back but I did carry her on my back for our town’s downtown trick-or-treating as well as at night. I had minions climbing all over me and doing my bidding! (I knit their hats). The ultimate babywearing is the wearing a mama does before a baby is born. This was our second year of a family theme. The picture was taken at our downtown trick-or-treating by a friend. This was our first family theme and first time really incorporating babywearing in to our costumes. 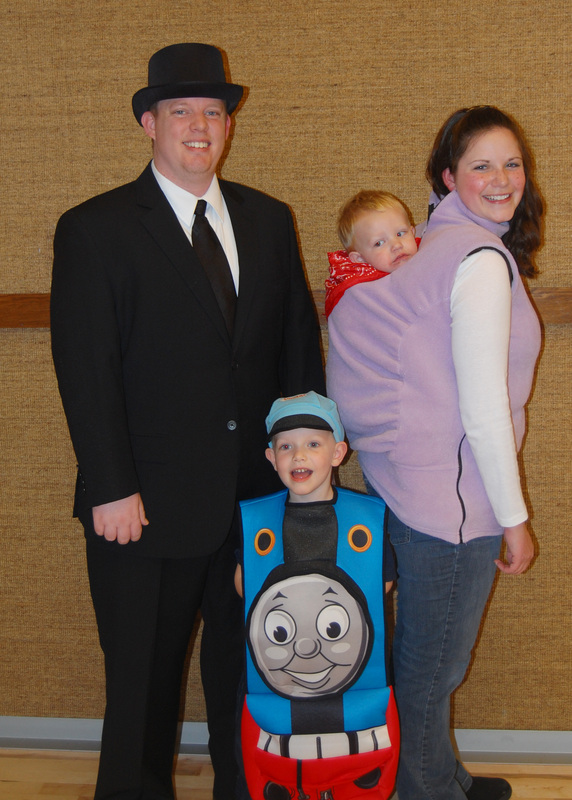 My oldest really wanted to be Thomas, my husband was Sir Topham Hat, I was Rosie (an engine on some of the episodes), and my little man was my conductor. I don’t have another picture of him because he was too wiggly at the time but he did have the stripped overalls and everything and looked adorable. The Peekaru kept me toasty while we went trick-or-treating. This was taken at a trunk or treat a week before, my husband was gone for Halloween this year. 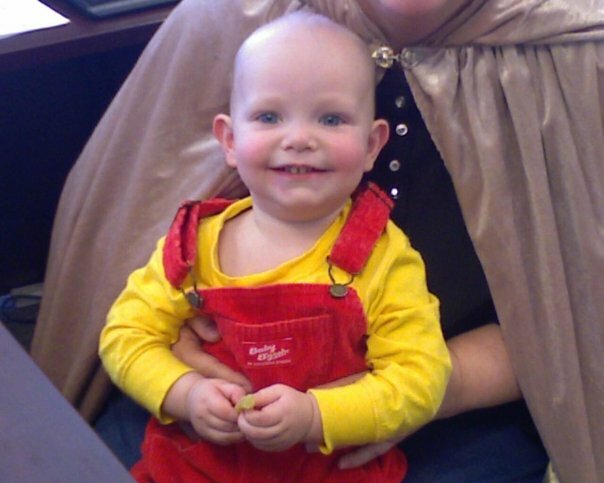 2011: The first year I wore one of my kiddos to go trick-or-treating. 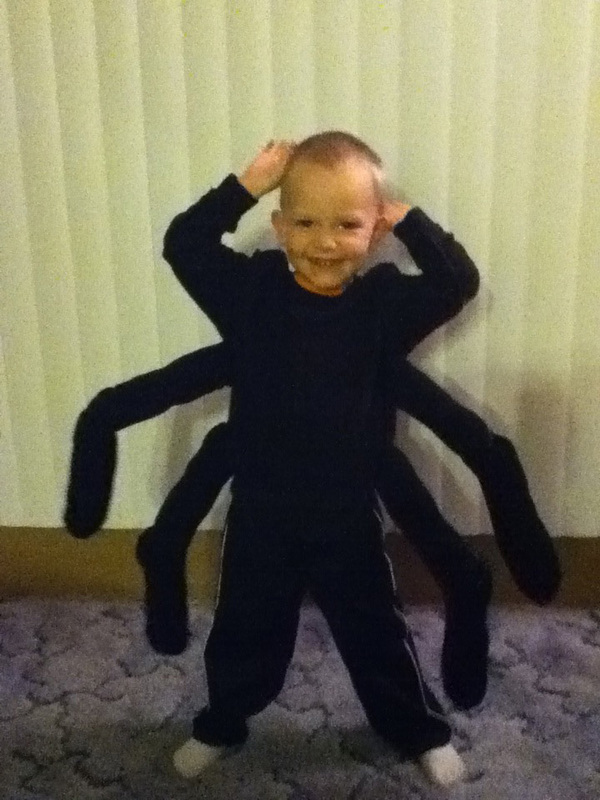 Monkey really wanted to be a spider this year, K-man was super in to froggies. 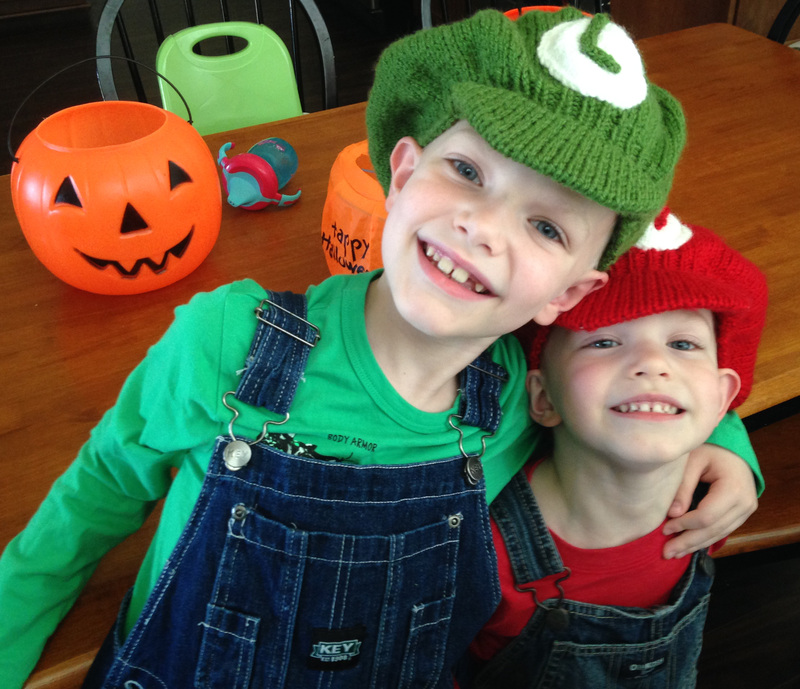 I made both of their costumes (including the knit hat on K-man). Sorry for the grainy pictures. My iPod didn’t take all that great of pictures and I forgot to take ones with my better camera but they were still super cute so I wanted to share the pictures anyways. And the years that I babywore but not for trick-or-treating because we just drove to each grandmas’ houses. 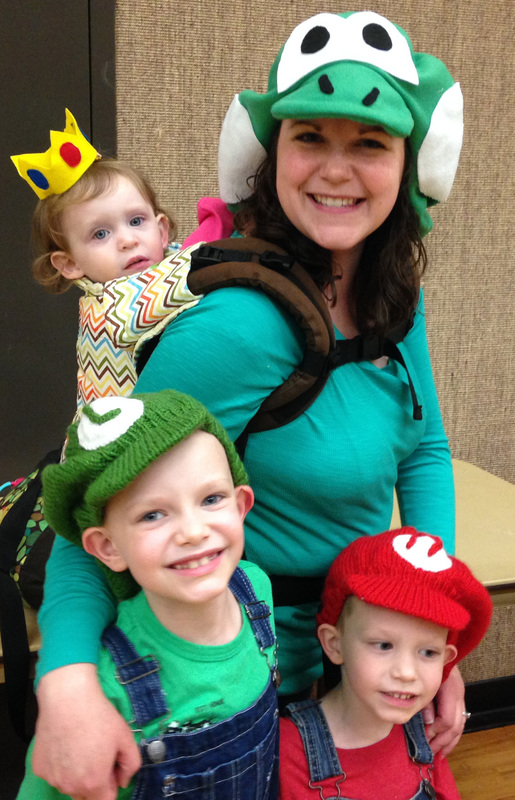 How have you incorporated babywearing in to your costume? Don’t forget to send your pictures by November 2!